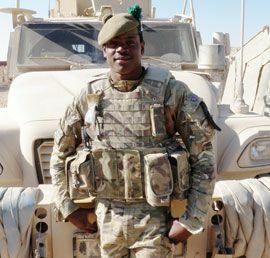 Private Marlon Martin (24) is based in Helmand province, with other members of his unit, The Argyll and Sutherland Highlanders, 5th Battalion The Royal Regiment of Scotland (known as 5 SCOTS). Troops from 5 SCOTS are primarily in Afghanistan to train and mentor the Afghan National Police, and bring the force up to a sufficiently high standard to take over security responsibilities, currently performed by British and NATO troops. There are currently around 117,000 fully-trained Afghan National Policemen in Afghanistan and the aim is to reach a target of 134,000 by the end of 2011. 5 SCOTSâ work in Helmand province represents a key part of achieving this target. Marlonâs specific role is as a member of a Police Advisory Team in the Babaji district of Helmand, where he works alongside the local Afghan National Police, providing security to the locals in the area and deterring Taliban activity. This deployment involves a lot of patrolling and time on the ground moving between different checkpoints and police stations. Marlon had a lucky escape recently when a Taliban, rocket-propelled grenade narrowly missed him during a battle with their fighters. Currently based in Canterbury, Kent, UK, the home of 5 SCOTS, Pte. Martinâs home is Mesopotamia, St Vincent, where he attended the Emmanuel High School. In his spare time he enjoys cricket, running and listening to music. Marlon joined the Army in 2009 and this is his first operational tour. He is one of many Caribbean soldiers who have taken advantage of the opportunity, open to citizens of Commonwealth nations, to join the British Army.